A trip to the farmers market yielded the ingredients to inspire and assemble this dinner. It didn’t require much: one chicken, a bunch of green garlic, potatoes, and lambs lettuce. A good glugg of olive oil, a head of garlic, and a lemon plucked from our tree was all that was needed to bring this meal together – and a skillet and a grill. Green garlic is young garlic which resemble thick spring onions. Its buttery and mild flavor is amplified when roasted and braised. 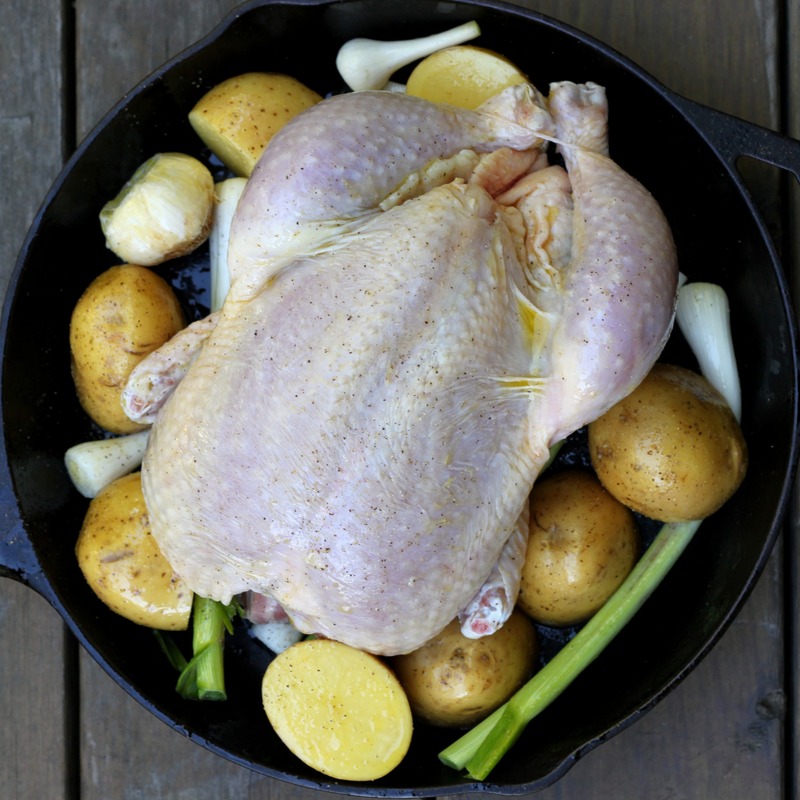 In this preparation, the green garlic’s bulbs and white stalks are tucked under a whole chicken which nestles in a skillet between hunks of potatoes and a garlic head while roasting. For serving, the reserved green garlic tips are chopped and tumbled with lemon zest, oil and a pinch of sea salt, for a bright gremolata garnish – making sure that the garlic stalks are completely put to use. 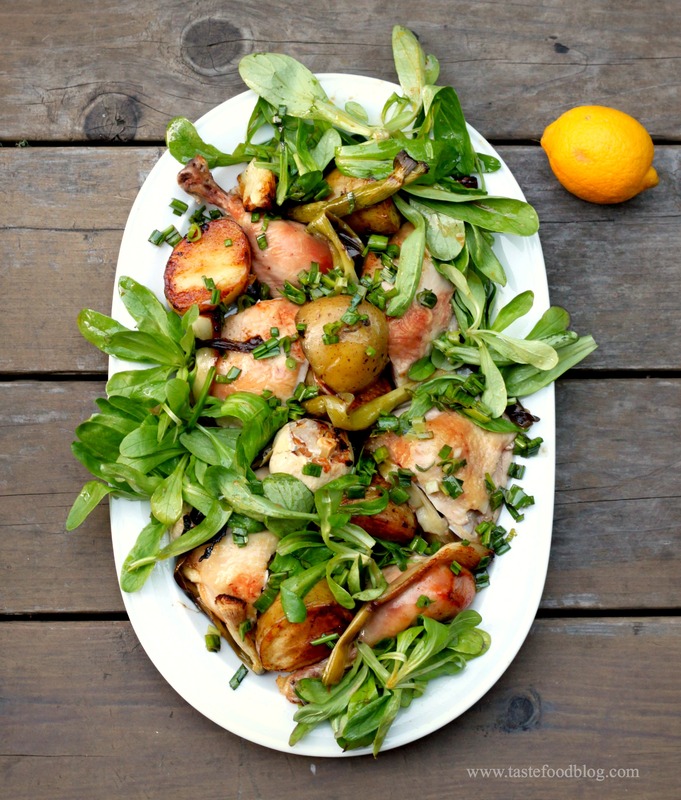 A fresh lambs lettuce salad, simply dressed with lemon and olive oil, surrounds the chicken, mingling with the pan juices which are redolent with the buttery roasted garlic cloves. One stop shopping and dinner at its best. The beauty of this recipe is its ease of preparation and one-skillet method. 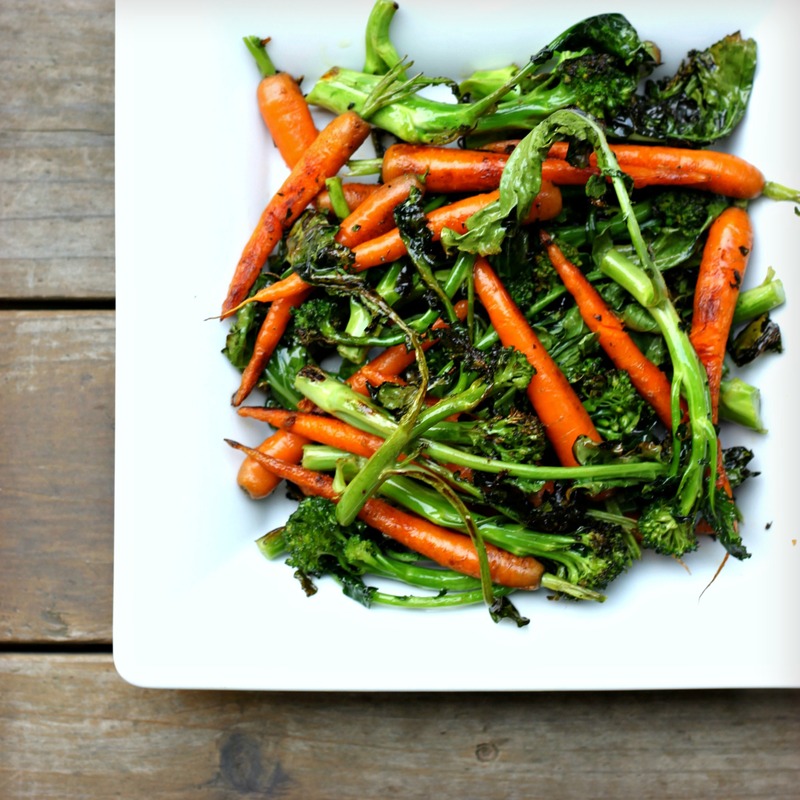 The veggies and chicken roast together – either on the grill or in the oven. Other vegetables such as onions and carrots may easily be substituted. Serves 4. 1 large head of garlic, outer layers of skin removed, top trimmed by 1/4 inch to expose the cloves. 1. If you have time, season the chicken all over including inside the cavity with salt. 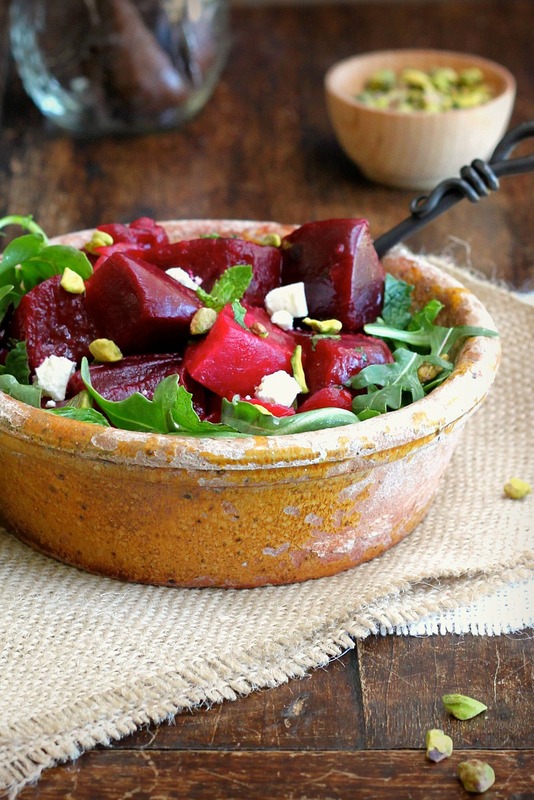 Place in a bowl or on a rimmed dish and refrigerate uncovered for a few hours. Remove from refrigerator 1 hour before roasting. Drizzle and coat with olive oil. Season with freshly ground black pepper. 2. Prepare a grill for indirect cooking over medium-high heat (about 400°F/ 200°C). If using an oven, preheat to 400°F. 3. Snip off the green stalks of the garlic scapes and set aside. Place the bulbs, the potatoes and garlic head in a large bowl. Drizzle with about 2 tablespoons olive oil and sprinkle with 1 teaspoon salt and 1/2 teaspoon black pepper. Toss to coat, then dump the vegetables into a large cast iron skillet (or grill-proof baking dish). Nestle the chicken into the center of the vegetables, breast-side up. Roast over indirect medium-high heat until the chicken is thoroughly cooked through, 1 to 1 1/4 hours, basting occasionally with pan juices and rotating the pan from time to time to ensure even cooking. Remove from the heat and transfer the chicken to a cutting board. Let rest for 15 minutes. 4. While the chicken rests, squeeze the roasted garlic into the pan and gently mix around to combine with the juices and vegetables. 5. Make the gremolata: Finely chop the green garlic tips and place in a bowl. Add 1 teaspoon finely grated lemon zest and juice of 1/2 lemon, 1 tablespoon olive oil, and a pinch of salt. Stir to combine. 6. Make the salad: Place the lambs lettuce in a large bowl. Whisk the oil, lemon juice, mustard and salt in a small bowl. Add to the lambs lettuce and toss to coat. 7. Spread the salad around the rim of a large platter, leaving the center clear for the chicken. Carve the chicken into serving pieces and arrange in the center of the platter. Scatter the roasted potatoes and garlic scapes around the chicken. Spoon some of the pan juices over the chicken and vegetables and sprinkle with the gremolata. It was tempting to fiddle with this salad, but I am happy I didn’t. 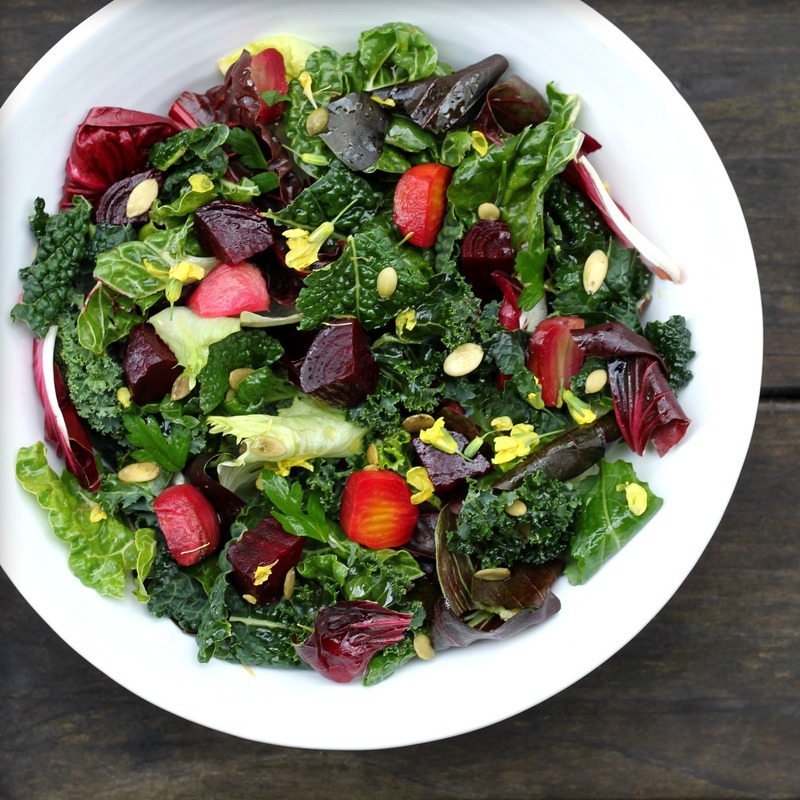 The beauty of this plate of greens is its simplicity. Bright fava beans, mint, spring greens and napped with lemon and olive oil. Favas are a bit of work to prepare, but well worth the effort. A good idea is to prep more than you need, then freeze the leftovers for easy use later. Feel free to mix the greens to your liking. 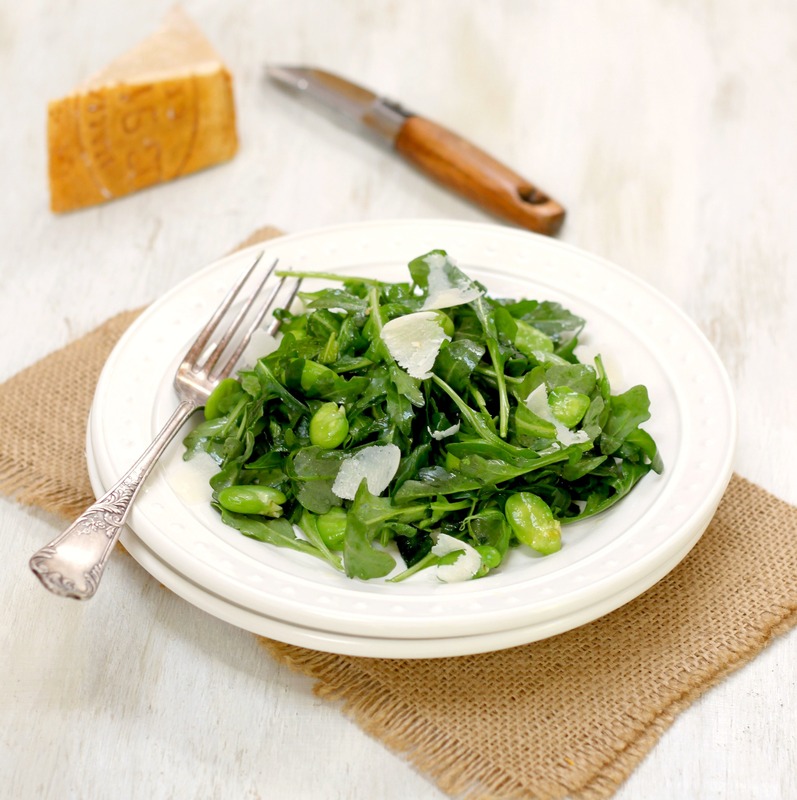 Peppery arugula is a must, on its own or combined with mizuna, baby spinach, watercress – they all work. If you can get your hands on fresh chervil, that will add nice flavor as well. 1. Shuck the fava beans. Bring a medium pot of salted water to a rolling boil. Add the beans and blanch until bright green, about 1 minute. Drain and rinse under cold water. When cool enough to handle, remove the shells. 2. Whisk the olive oil, lemon juice, lemon zest, and salt in a small bowl. 3. Combine the fava beans, greens and mint in the salad bowl. Drizzle with half of the dressing and toss to coat. Add more dressing to taste. Scatter the cheese over the salad and garnish with freshly ground black pepper. A trip to the farmers market yielded the ingredients to assemble this spring dinner. It didn’t require much: one chicken, a bunch of green garlic, potatoes and lambs lettuce. A good glugg of olive oil, a head of garlic, and a lemon plucked from our tree was all that was needed to bring this meal together. And a skillet and a grill. 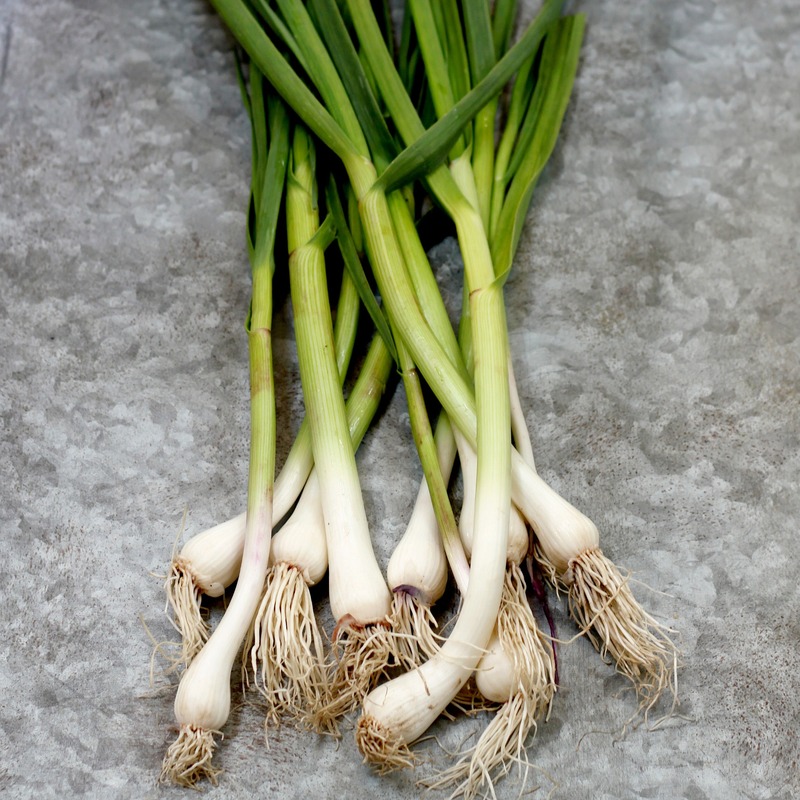 Green garlic is young garlic and resembles thick spring onions. Its flavor is buttery and milder than garlic cloves, and it’s delicious roasted and braised. In this preparation, the bulbs and white stalks were tucked under the chicken which nestled in a skillet surrounded by potatoes and the garlic head. The green garlic tips were chopped and tumbled with lemon zest, oil and a pinch of sea salt, for a bright gremolata garnish – and no waste. Lambs lettuce is mild and pleasantly nutty and best simply dressed so as not to overwhelm its delicate flavor. I dressed it lightly with oil and lemon and scattered it around the carved chicken. And the roasted head of garlic? Squeezed into the pan juices for deep flavor and a rich final touch. 1 large head of garlic, outer layers of skin removed, top trimmed by 1/2 inch to expose the cloves. 3. Snip off the green stalks of the garlic scapes and set aside. Place the bulbs, the potatoes and garlic head in a large bowl. Drizzle with about 2 tablespoons olive oil and sprinkle with 1 teaspoon salt and 1/2 teaspoon black pepper. 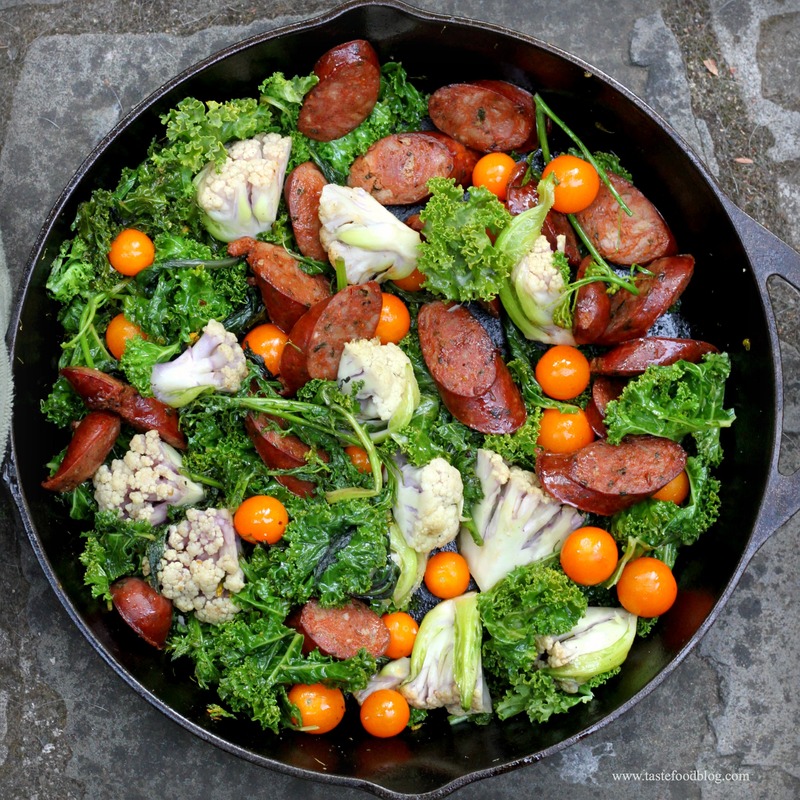 Toss to coat, then dump the vegetables into a large cast iron skillet (or grill-proof baking dish). Nestle the chicken into the center of the vegetables, breast-side up. Roast over indirect medium-high heat until the chicken is thoroughly cooked through, 1 to 1 1/4 hours, basting occasionally with pan juices and rotating the pan from time to time to ensure even cooking. Remove from heat and transfer the chicken to a cutting board. Let rest for 15 minutes. 5. Finely chop the green garlic tips and place in a bowl. Add 1 teaspoon finely grated lemon zest and juice of 1/2 lemon, 1 tablespoon olive oil, and a pinch of salt. Stir to combine. 6. Place the lambs lettuce in a large bowl. Whisk the oil, lemon juice, mustard and salt in a small bowl. Add to the lambs lettuce and toss to coat. 7. Carve the chicken into serving pieces and arrange on a large serving platter. Arrange the roasted potatoes and garlic scapes around the chicken. Scatter the lambs lettuce around the chicken and vegetables. Spoon some of the pan juices over the chicken and vegetables and sprinkle with the gremolata.